The recent paper from van Hoesel et al., Nanodiamonds and wildfire evidence in the Usselo Horizon postdate the Allerød-Younger Dryas Boundary, confirming nanodiamonds in the Dutch Younger Dryas Boundary (YDB), or Usselo Horizon, establishes a cynical new low for the intellectual integrity of our debate. Despite confirmation of this extraordinary material in the Usselo Horizon — precisely as claimed by the YDB proponents — the authors give zero credit to YDB authors for the predictive power of their claims. Zilch. And worse, the Dutch perform rhetorical gymnastics to disassociate the tiny gems from an extraordinary cause. The authors employ a tortured two-part feint to avoid the truth: 1) the diamonds come from wildfires; and, 2) the diamonds are too young to have come from the Younger Dryas onset. Wildfire. They establish no mechanism for the common natural process of wildfire resulting in diamond, nor do they provide any evidence that diamond has been noted in the past as a product of wildfire. No cites, no speculation to speak of, just a belief that now wildfires create diamonds because….well, just because. In contrast, the YDB team has not only reproduced a terrestrial mechanism for diamond formation (albeit from cosmic causation) — they have patented it. [Here and here] Seems those links could have provided an informative cite in van Hoesel, et. al., no? Apparently, parading about the naked non-explanation of “wildfires” is preferable to daring admit that something anomalous has been found. When confronted with extraordinary material in extraordinary places, the authors conjure up an unexplained and previously unidentified result of a prosaic process. Substituting the impossibly normal for the extraordinary is a tired meme in the catastrophist\uniformitarian drama. Dating. 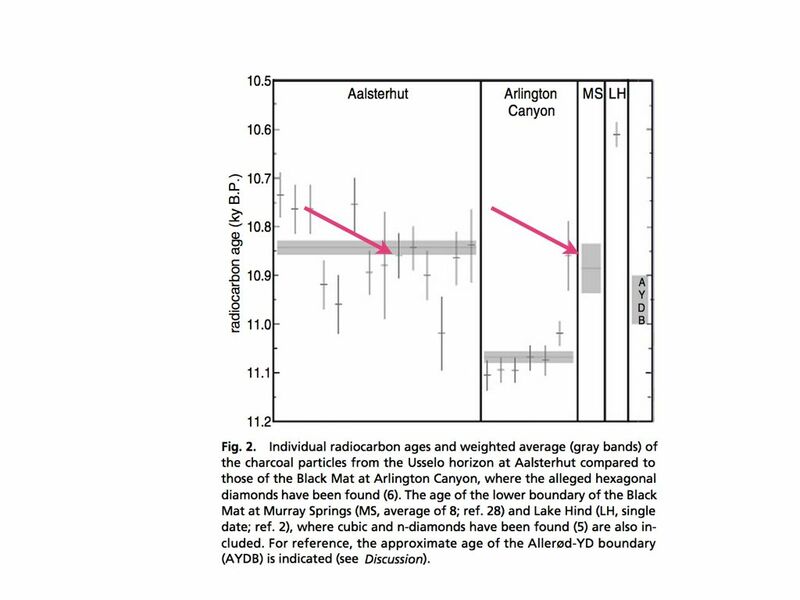 The paper denies confirmation of the YDB team by concluding that the radiocarbon dates are two hundred years younger than YD onset. Given the 12,900 year interval — and the predictive power of the YDB hypothesis — a two hundred year range could well have been accepted as a dead heat. However the authors choose the path of cognitive dissonance, exaggerated confidence, and added a measure of deceptive incompetence. “Deceptive incompetence! ?,” you say, I do not know what else I can call it. The Dutch team is calibrating their radiocarbon dates using the more recent “IntCal09” calibration curve, whereas the YDB team’s publication utilized the earlier curve, “IntCal04.” It is an objective and well understood fact — not revealed in the van Hoesel paper — that the change in protocol would result in an (irrelevant) deviance of at least 100 years younger. Only incompetence, or deception, can account for such an oversight. I split the difference and term it: Deceptive incompetence. The remaining one hundred year discrepancy (.8% of 12,000) should be dismissed as well. Just take a look at this graph from the van Hoesel paper. How sad these folks can’t screw up the courage to tell us they found the same thing in the same soils at the same time. But moving on from the conclusions in van Hoesel et. al., let’s put the paper into the wider context of other non-refutations of the YDB event. Compare van Hoesel to Daulton-Pinter and Scott-Pinter, papers widely reported as nails in the coffin of the YDB hypothesis. To its credit, van Hoesel serves to pull on the nails a bit — and perhaps yank one out. Is the comet theory a teeny bit less “carbonized” now, Rex? Rex!? Rex!!?? Second, Scott-Pinter’s paper has been undermined. That insulting article claimed that the carbon spherules studied for hundreds of hours by the YDM team were simply misidentified bug feces and fungus. This paper too was reported with vigor and did damage to the hypothesis, despite being a shallow investigation. Anyone reading this passage might take that statement as implying that, since nanodiamonds have been found elsewhere in Europe, in shallow soils, the deeper earth diamonds van Hoesel and the YDB team located are somehow less extraordinary — diamonds or not. 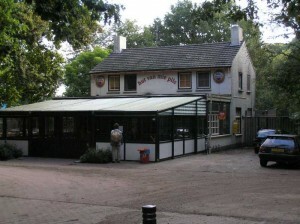 Unlike Surovell, and the Pinter mini-series, van Hoesel et. al. is not flawed in methodology, nor particularly hostile. But perhaps their sin is even more severe: They are cowardly. They fear the extraordinary and explain it away with the ordinary. Thank goodness van Hoesel is not the last word. Stay tuned…..
PS. Readers of this post may enjoy perusing the Field Report from the Netherlands and Russia from Andre Andronikov, a seemingly open-minded researcher who visited some of the aforementioned European black mat sites.